This is a set of 8 LED pucks designed to nest into the float of Kasco 2400SF xStream Fountains. Offered in classic white, these super-efficient low-voltage lights have a life expectancy of over 50,000 hours. 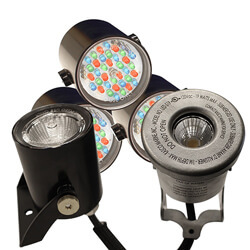 The complete kit includes the set of 8 lights, power cord, and a junction box. Extend the enjoyment of your Kasco xStream Fountain into the evening hours by adding this WaterGlow lighting package today.